Cheese ravioli baked in a roasted garlic pasta sauce with Italian sausage, green peppers, and onion, then topped with mozzarella and mascarpone cheese. By now you guys must know how much I love RAGÚ® Homestyle sauce (and if you didn’t already know, seriously, check out those links!) and today marks another delicious chapter in my ever-growing love for their sauces. And, you guys, not to brag or anything (well, okay, maybe just a little) but I think I may have outdone myself with this recipe. Because, yes, it was that good. 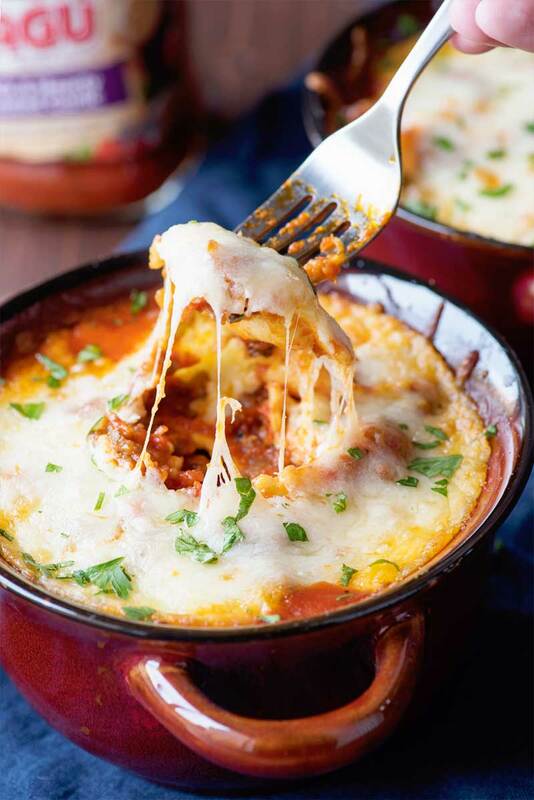 I loved everything about this recipe – from the flavorful RAGÚ sauce (I used Thick & Hearty Roasted Garlic this time around) to the ultra-cheese topping to the tasty Italian sausage – and it all came together into the kind of dinner that The Husband and I devoured in only one sitting. The only “downside” to this recipe? Technically, it wasn’t my idea to make it. I made a dish that I’m really happy with. I let him try it and ask him what he thinks. I’m just waiting for the day when he says this about a brownie or a cake. So when I was brainstorming for this recipe, I did something I almost never do: I asked him what he wanted me to make. What wasn’t I making that he wanted to see? Was it a kind of pasta? Or a specific type of meat? Eventually we settled on Italian sausage and ravioli, since even I couldn’t remember the last time I had used either of those in a dish. The original idea was to make homemade sausage ravioli, and though I loved that idea, I really wanted something a little bit easier to put together. We’re still knee-deep in summer and didn’t want to stand around in my hot kitchen for hours just to make dinner. As an alternative, I opted to cook the Italian sausage in the RAGÚ Thick & Hearty Roasted Garlic sauce, and it ended up being the perfect compromise. We still got all the benefits of a meaty meal without slaving in the kitchen. Score! When we were almost done with brainstorming, The Husband’s face grew serious, and he proceeded to tell me (with hand gestures!) that he was envisioning a picture of a small baking dish full of our soon-to-be baked dinner, and that there would be a fork dipping in and pulling up a cheese-covered ravioli. He stressed to me that this should be a picture I took when photographing this dish. Would you like to make this dish at home? Be sure to pick up any of RAGÚ® Homestyle sauce! In a skillet over medium-high heat, cook and crumble Italian sausage with green bell pepper and onion until sausage is cooked through, about 5-7 minutes. Drain grease. Add Ragu Homestyle Thick & Hearty Roasted Garlic pasta sauce and chopped Italian plum tomatoes to skillet, then stir. Reduce heat and let sauce simmer for 30 minutes. While sauce is simmering, preheat oven to 350 F. Coat your chosen baking dish (either an 8x8 dish or individual oven-safe dishes) with cooking spray, then set aside. Prepare ravioli per package instructions, then drain and set aside. In a medium bowl, use your hands to knead together 1 cup mozzarella and the mascarpone cheese, then break cheese mixture into crumbles with your fingers. Set aside. When sauce is ready, add ravioli to pan and stir to coat. Pour ravioli into your prepared baking dish(es), then cover the top with an even layer of the cheese crumbles. Finish by sprinkling the remaining 1/2 mozzarella cheese on top. Bake Italian sausage ravioli for 15-20 minutes or until the cheese on top has completely melted. Yum! This looks soooo good! I love how flavorful the Roasted Garlic variety is! This looks really good! Thanks for the recipe and the giveaway! Have a great weekend! This is a good dinner recipe for back to school weeknights. Thanks for the giveaway. I love a thick sauce. I would try the Homestyle Thick & Hearty Mushroom sauce. I absolutely love the Ragu thick & hearty four cheese. I cant wait to try this recipe out. looks great. What a great recipe and the sauces are amazing I have tried them! Love it ! Hit me good . Amazing recipe & and I use them all the time . Homestyle Thick & Hearty Roasted Garlic Sauce sounds so yummy! wow. look super hot yummy.. This dish looks super yummy looking forward to trying it. I would love to try the cheese sauce. I would love to try the HOMESTYLE THICK & HEARTY ROASTED GARLIC SAUCE.